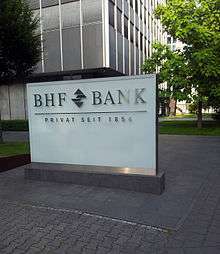 BHF-Bank is a private German bank owned by Oddo & Cie. It was one of the leading German investment banks in the 1970s and 1980s and held a top position in the foreign exchange market. The bank has an international presence, with branches in Luxembourg, Switzerland, the UAE, Egypt and Vietnam. BHF-Bank was formed on 1 January 1970 as the Berliner Handels- und Frankfurter Bank from the merger of the Frankfurter Bank (founded in 1854) and the Berliner Handels-Gesellschaft (founded in 1856). 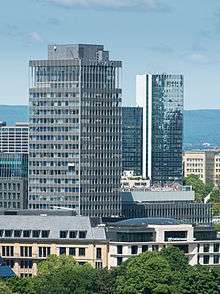 In 1970, when the BHF-Bank tower was built by the German architect Sep Ruf, it was the highest building in Frankfurt. The banks changed its name to BHF-Bank in 1975. Through the 1970s and 1980s it was in the top three to five investment banks in West Germany and had a top position in the foreign exchange market. The bank had extensive industrial holdings. Its former senior partner, Hanns Schroeder-Hohenwarth, became the President of the German Banks Association from 1983 to 1987. In 1995 the bank went public, changing from a partnership to a corporation. From 1999 to 2004 it was bought by the Dutch ING Group and renamed from 2002 ING BHF-Bank. In the same year it was delisted following the squeeze out of remaining share holders. In 2004 ING BHF-Bank was split. The majority of the bank’s business operations, offices and equity shareholdings were integrated into the newly founded BHF-BANK Aktiengesellschaft, which was then acquired by the private bank Sal. Oppenheim as its sole shareholder. When Sal. Oppenheim was taken over by Deutsche Bank in 2010, BHF-BANK, which has always operated on a stand-alone basis, was put up for sale. Since 2014, the bank has formed part of BHF Kleinwort Benson Group, which was taken over by the French private bank Oddo & Cie. By mid-March 2016, Oddo & Cie had acquired 100% of BHF Kleinwort Benson Group’s shares, and has thus become BHF-BANK’s indirect sole shareholder. BHF-BANK Foundation was set up in 1999 to improve Germany society. It has supported the Senckenberg Museum in acquiring new exhibits and the Frankfurt Red Cross with emergency rescue equipment. ↑ Pohl, Manfred; Freitag, Sabine; History, European Association for Banking (1994-01-01). Handbook on the History of European Banks. Edward Elgar Publishing. ISBN 9781781954218. ↑ "BHF-BANK Foundation|Corporate Citizenship|BHF-BANK|Homepage|BHF-BANK Aktiengesellschaft". www.bhf-bank.com. Retrieved 2016-01-11.